Manufacturer of a wide range of products which include rockwell hardness testers. We are one of the leading manufacturers and suppliers Hardness Testers. These testers are manufactured using optimum grade raw material which is sourced from trusted vendors of the market. All the testers offered by us are widely appreciated by our clients for its high durability and sturdy construction. Our clients can avail these testers from us in varied sizes and other specifications as per their need. 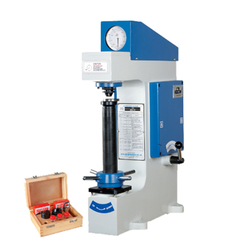 Looking for Hardness Tester Machines ?